South Carolina's Republican governor said Monday that the Confederate flag "does not represent the future" of her state. 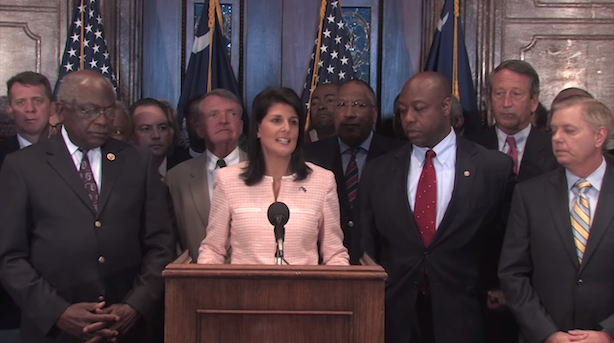 South Carolina Governor Nikki Haley addresses the media on Monday. South Carolina Governor Nikki Haley said the Confederate flag should no longer be flown at the State House in Columbia. "We are not going to allow this symbol to divide us any longer," the Republican governor said during a brief press conference on Monday. Throughout her remarks, she emphasized honoring the nine victims who lost their lives last week when a gunman opened fire in a historic, traditionally black Charleston, South Carolina, church. Her comments concluded with her request that the focus stay on the men and women who lost their lives last week. In speaking about the flag, Haley said accused gunman Dylann Roof has a "sick and twisted view of the flag," which she said does not align with those who "respect, and in many ways, revere it." However, she acknowledged that for many South Carolinians, it’s a "deeply offensive symbol of a brutally oppressive past." Flags flown on private property won’t be encroached upon, Haley said, adding that while it may find its place in a museum, the Confederate standard should no longer be welcome at the Capitol. "That flag does not represent the future of our great state," she said. Journalists reacted to Haley’s decision on Twitter on Monday afternoon. Nikki Haley says Roof had a "sick and twisted view" of the flag. Uh, NO, I think he understood it + what it stands for pretty effing well. "I support Nikki Haley's decision" - politician who lacked any backbone until 15 minutes ago. Props to Nikki Haley. It's the right thing to do. "Walker sources" email to claim that he wanted the flag down this weekend but had to wait for Nikki Haley's announcement.